Download the [Android SDKv2.0 publishers for Unity]. Decompress the zip file and extract the files to your development computer. 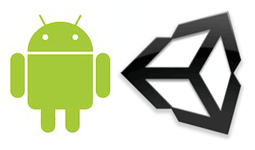 The Android SDK for Unity is provided as two frameworks files (AndroidSDKPublisher.jar et A4GPublisherUnity.jar), making it easy to include in your Android project. Create a ‘Plugins’ folder and within this create another folder called ‘Android’ (Assets­>Plugins­>Android). Copy the AndroidSDKPublisher.jar and the A4GPublisherUnity.jar into this folder. Build the project for Android and then go into the ‘Temp\StagingArea’ folder with your project folder and copy the AndroidManifest.xml file into the ‘Android’ folder. You will create a C# file that will attach to a Unity GameObject as a script. The C# file need to be under the Assets folder. Now, go to File ­>Build Settings ­>Player Settings, and change the Bundle Identifier to com.a4gpublisherunity. 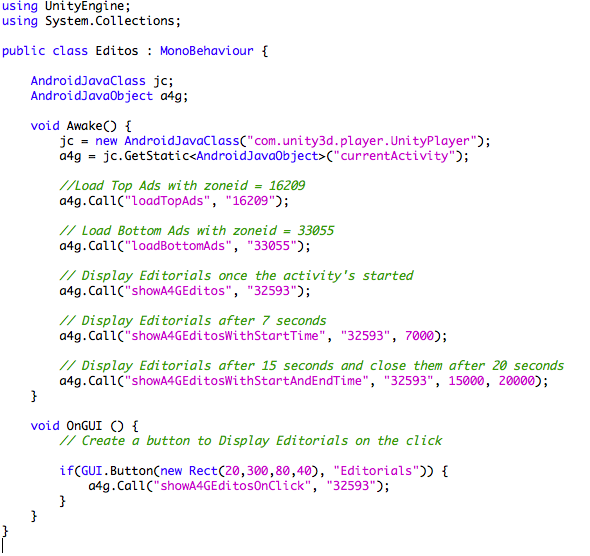 Build the Unity project for Android platform and run it on your device to see the ads. 1­- showA4GEditos : If you want to display the editorials once the activity's started. 2­- showA4GEditosWithStartTime : If you want to display the editorials after certain time. 3­- showA4GEditosWithStartAndEndTime : If you want to display the editorials after certain time and close them automatically after certain time. 4­- showA4GEditosOnClick : If you want to display the editorials when the user click on a button. valid from android 2.3 or above. Download the [Android SDKv1.0 advertisers for Unity]. Decompress the zip file and extract the files to your development computer. The Android SDK for Unity is provided as two frameworks files (AndroidSDKTracker.jar et A4GTrackerUnity.jar), making it easy to include in your Android project. Copy the AndroidSDKTracker.jar and the A4GTrackerUnity.jar into this folder. You will then create a C# file that will attach to a Unity GameObject as a script. The C# file need to be under the Assets folder. Now, go to File ­>Build Settings ­>Player Settings, and change the Bundle Identifier to com.a4gtrackerunity. Download the [iOS SDKv2.0 publishers for Unity]. Decompress the zip file and extract the files to your development computer. The iOS SDK for Unity is provided as a single framework file (A4GPubUnity.framework), making it easy to include in your iOS project. Build your Unity project for iOS, then open the generated xcode project. To include the A4GPubUnity.framework to your xcode project, you need to select your target project, and then go to Build Phases → Link Binary With Libraries, then click on the + sign → Add Other, and select the A4GPubUnity.framework saved on your computer. You need to include the AdSupport.framework to your project target to enable the Advertiser Identifier functionality. Go to Build Phases → Link Binary With Libraries, then click on the + sign to add the AdSupport.framework. Then, change the value of AdSupport.framework from Required to Optional. You need to include the SystemConfiguration.framework to your project target to enable the detection of the connection type. Go to Build Phases → Link Binary With Libraries, then click on the + sign to add the SystemConfiguration.framework. – You need to import the A4GPubUnity.framework, after the last #import. – Instantiate the window declared inside appController.h file. – Instantiate an object of A4GPubUnityViewController. – Add a imageView and Button with the same size of the ad to display (the button need to be above the imageView and need to be transparent). * setZoneID method allows you to set the zoneID. * getRefresh method to refresh the display of banners. * loadAds method to get banners from ad4game servers. – Instantiate an object of A4GEdito. – You need to add a UIButton if you want to launch the editorials when the user clicks on that button. * showA4GEditos method, to display directly the Editorials when the app started. * showA4GEditosWithStartTime method, to display the Editorials after a certain time. * showA4GEditosWithStartAndEndTime method, to display the Editorials after a certain time, and close them automatically after a certain time. [a4gEdito showA4GEditos]; // Show Editorials when the app started. [a4gEdito showA4GEditosWithStartTime : 10]; // Show Editorials after 10 seconds. [a4gEdito showA4GEditosWithStartAndEndTime : 10 withArg2 : 20]; // Show Editorials after 10 seconds and close it automatically after 20 seconds. Download the [iOS SDKv1.0 advertisers for Unity]. Decompress the zip file and extract the files to your development computer. The iOS SDK for Unity is provided as a single framework file (A4GUnityTracker.framework), making it easy to include in your iOS project. To integrate the Ad4game iOS plugin in your Unity app, you will be creating a C# file that will attach to a Unity GameObject as a script. The C# file need to be under the Assets folder. In the C# scripts, DllImport attribute needs to be set for the trackInstall method to be imported from the plugin code. 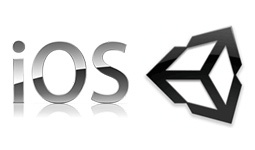 Build the Unity project for iOS platform. Note that a new iOS Xcode project is generated. Open the iOS project in Xcode. and then go to Build Phases → Link Binary With Libraries, then click on the + sign → Add Other, and select the A4GUnityTracker.framework saved on your computer. You need to include the AdSupport.framework to your project target to enable the Advertiser Identifier functionality. Go to Build Phases → Link Binary With Libraries, then click on the + sign to add the AdSupport.framework. You need to include the SystemConfiguration.framework to your project target to enable detection of the internet availability. Go to Build Phases → Link Binary With Libraries, then click on the + sign to add the SystemConfiguration.framework. If you've got questions, we've got answers! Please Contact Us at tech@ad4game.com with any technical queries. This page was last modified on 2 October 2013, at 08:11. This page has been accessed 13,076 times.